Frances went here with Aunt Jeunie & kindly brought me this lovely card. a. Blue Parrot, Late. b. Rosey Wings, Mid-Season. c. White Dream, Early. d. Burgundy Lace, Mid-Season. e. Apricot Beauty, Early. f. Mariette, Mid-Season. g. Temple of Beauty, Late. h. Angelique, Late. i. Spring Green, Late. j. Mosaic, Diseased Bulb. 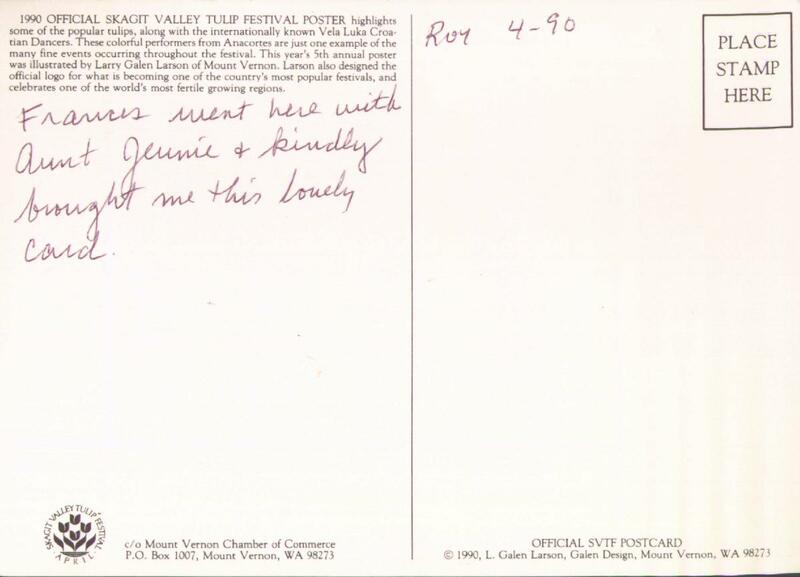 Tulip names indicated on postcard only. 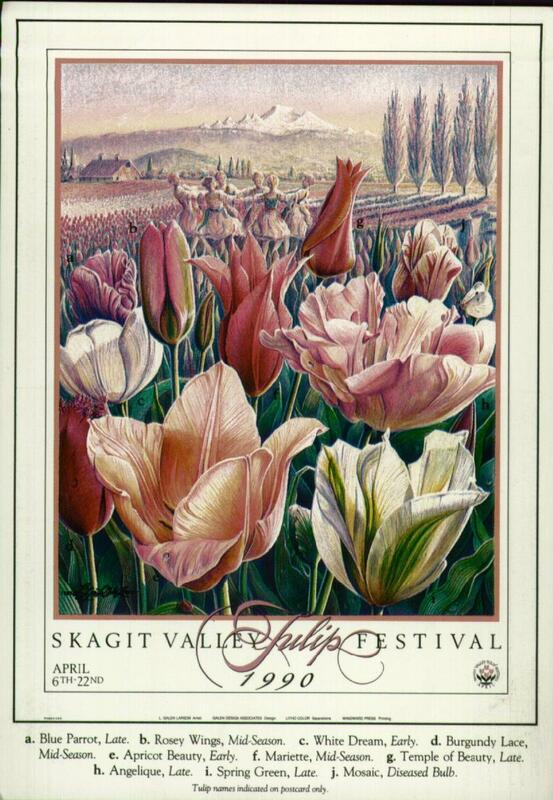 1990 OFFICIAL SKAGIT VALLEY TULIP FESTIVAL POSTER highlights some of the popular tulips, along with the internationalyly known Vela Luka Croatian Dancers. These colorful performers from Anacortes are just one example of the many fine events occuring throughout the festival. This year's 5th annual poster was illustrated by Larry Galen Larson of Mount Vernon. Larson also designed the official logo for what is becoming one of the country's most popular festivals, and celebrates one of the world's most fertile growing regions. © 1990, L. Galen Larson, Galen Design. Nice poster! And the event seems right up my mother's and LeJeune's alley (alleys?). Funny details: "Tulip names indicated on postcard only," and the fact that there's a virus ("Diseased Bulb") that, rather than killing the tulip, makes it more expensive.